Going through a divorce is not easy. Among the many things that you need to consider, you may be wondering if you must hire a divorce lawyer. While you are not required by law to have a divorce lawyer in order to file for a divorce, depending on your situation, you may need one to ensure the process runs smoothly. In many cases, the parties getting a divorce do not agree on what should be included in a settlement. If this is the case with you and your soon-to-be ex-spouse, a divorce lawyer can help you come to a settlement easier as he or she can outline what is fair and what is not. Often, a divorce comes with ill feelings. If you and your spouse are not ending your marriage amicably, you will likely have a hard time negotiating with him or her. When you hire a divorce lawyer, he or she will act as a liaison between you and your spouse, meaning you do not have to have back and forth meetings that end in arguments. Ending a marriage is an emotional process. And when you have to deal with the entire process on your own, it can become overwhelming. When you hire a divorce lawyer, you will not be alone. Your lawyer will help you with all aspects of your divorce and help reduce the emotional stress involved. No one wants their divorce to drag on indefinitely. But that might very well happen if you file for a divorce without a lawyer, especially when there are complicated matters for you and your spouse to settle. A divorce lawyer knows the ins and outs of the process. He or she has been through it many times and therefore will know how to move the process along quickly. A divorce lawyer will explain the terms of your divorce. When a couple decides to get a divorce, they will then need to divide property, come up with a shared custody agreement or decide who will maintain sole custody of children (if there are any). The couple will also need to determine whether there will be alimony or any other financial obligations. Once you and your spouse reach an agreement, your lawyer will explain what it means for you before you sign anything. If your divorce causes a nasty custody battle, your divorce lawyer will fight to protect your parental rights. In some cases, the intervention of your lawyer can bring about a resolution without having to involve the courts. One of the most frustrating parts of a divorce is the amount of paperwork it involves. This paperwork can be confusing. If you do not fill out the required documents correctly, a judge will not be able to grant your divorce. An experienced divorce lawyer will explain all the relevant documents and ensure everything is filled out properly and signed in all the right places. Do you need a divorce lawyer in Toronto? 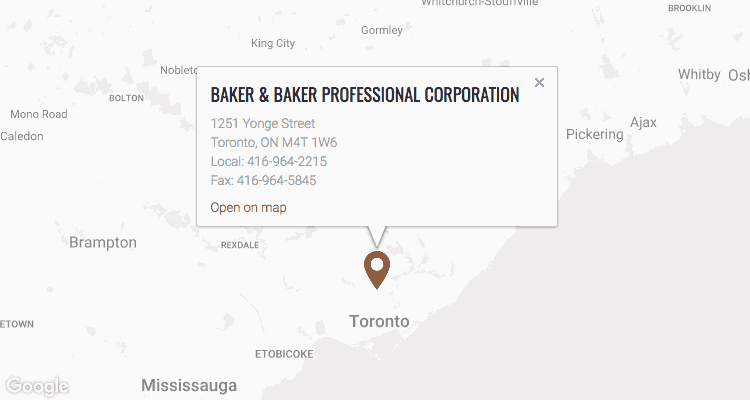 If you are contemplating or going through a divorce in Toronto and need a divorce lawyer, give us a call at Baker & Baker Family Law. At Baker & Baker Family Law, we boast a team of 7 family lawyers with 90 years of combined experience. Therefore, we are in a strong position to help you with your divorce. So, what are you waiting for? Contact us today.